Erik Ellefsen’s recent posts on the false choice of charter schools created good stir in the private school world. 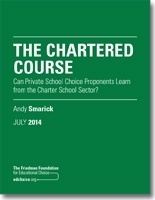 To deepen your understanding of the impact of charter schools in the United States, we encourage you to download the most recent research report from the Friedman Foundation. According to Andrew Coulson (CATO Foundation), charter schools served over 2 million students in 2011 and his statistical extrapolations estimate this number growing to over 4 million by 2020. Charter schools drew over 200,000 students from the private sector between 2000 and 2008 and the pace is accelerating. Charter schools have an incredible advantage to use public funding for education. Christian educators must be well-versed in this movement.